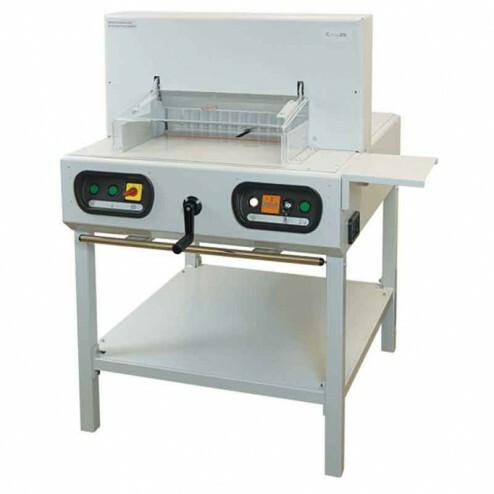 The Formax Cut-True 27S Semi-Automatic 18.9" Stack Paper Cutter saves time and money. The Formax Cut-True 27S Semi-Automatic Electric Paper Cutter is perfect for print shop and in-house print finishing. With crisp accurate cuts the Cut-True 27S transforms invitations, brochures and so much more. The CT27S cuts stacks over 3.15 inches high and 18.9 inches wide. Like other cutters in Formax's True-Cut series this semi-automatic cutter requires very little effort thanks to its electronically-controlled two-button operation.Other series features are; calibrated scales and the LED laser help ensure precision cutting, electronically-controlled safety cover, safety lock with key, blade lock, and wooden paper push all help to ensure user safety. Plus, a rugged metal stand for a stable work surface.